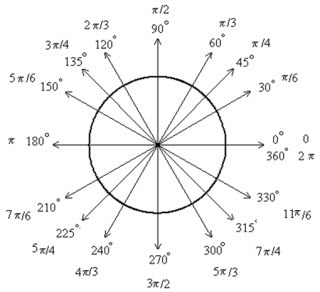 I often think about the unit circle - more specifically, I visualize it in my mind when evaluating the exact value of a trigonometric function (sine, cosine & tangent to be precise) for a 'special' angle (i.e. a multiple of or ; or ). I find that a dynamic image of the unit circle in my mind is as useful a tool as my very real graphic display calculator. I also think about the unit circle when considering ways to help students understand notions such as arc length, radian measure, standard position of an angle - and, of course, a tangible way of understanding the relationship between different trigonometric functions - and, as I mentioned, evaluating the exact values of trig functions for 'special' angles. I believe that this last purpose (finding exact values of trig functions) is a sufficient reason on its own for requiring students to use the unit circe (both 'on paper' and also imagining it 'in their head'). Ways of doing this can range from the high-tech and dynamic to the very simple and static. Many students have already encountered the unit circle in a previous math course - but I start with the assumption that students are not familiar with it. I first make sure students are fluent in being able to identify all of the special angles between 0 and 2 ( ) in both radians and degress - with special emphasis on radian measure since students are often much less familiar with radian measure than degree measure. Part of this discussion should also involve students knowing the conversion factors for translating from degrees to radians, , and for changing radians to degrees, . I then have students play around with dynamic unit circles - either from a website, or one created using some dynamic math software such as Geometers Sketchpad or Geogebra - or even using their graphic display calculator (GDC). The video below is a demonstration of a calculator program I wrote several years ago for the TI-83 calculator. It also works on a TI-84 calculator. This demonstration is on my much-used TI-84 Plus Silver Edition calculator. The file for the program is available as a download at the end of this blog entry - and also on the following page on the site. I combine these dynamic animations with the unit circle with students "filling out" a blank unit circle. I have made a document that has a very large unit circle on it with all of the special angles marked with places for students to write in the angles and the x and y coordinates of the points where an angle's terminal ray intersect the unit circle - which gives the cosine and sine, respectively of the angle. I usually have students fill one out in radians and another in degrees. I follow all of this up with a few strictly timed assessments that I call Quick Trig Quizzes (or QTQs). Each QTQ has ten trigonometric expressions - such as or - and students need to write down the exact value of each within a set time. I usually make the first QTQ a bit gentler by letting students use a 'cheat sheet' with a completed first quadrant of the unit circle and give them more than five minutes. But then on subsequent QTQs students cannot have anything with them except a pen or pencil and they are given less than five minutes. On the last QTQ I challenge students to finish it in less than a minute. Speed is not the most important skill with regard to being able to give exact values for the sine, cosine and tangent of special angles but it does encourage students to develop the ability to quickly visualize the unit circle in their head and efficiently and accurately determine the value of trig functions.